A London museum is helping to highlight an eco-friendly way of creating "free" energy that was invented almost 200 years ago. 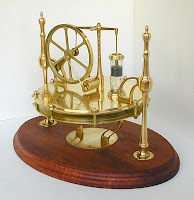 Stirling engines (a desktop model is shown here) were commonplace around 1880 to 1920 but fell out of fashion with the advent of the electric motor. Amid concerns over global warming, the Kew Bridge Steam Museum is organizing a rally to showcase these engines, which some scientists believe have a role to play in delivering clean energy. Originally invented in 1816 by the Rev Dr Robert Stirling (1790-1878), they are closed-circuit combustion engines. They work by using heat to warm a cylinder. The air within the cylinder expands with an increase in pressure that in turn drives the engine. True Stirling engines also incorporate a regenerator, which stores heat energy during one part of the cycle and releases it later, making the engine even more efficient. The rally, to be held on March 25 at the museum in Brentford, will bring together more than 80 working engines made by members of the Stirling Engine Society. It will focus on working models and engines designed to stretch the application of this technology and is thought to be the largest event of its kind ever staged.